People, I made graphics to illustrate the awesomeness of bargain shopping. I even did some math and stuff so I could compare apples to apples for you, my dearest readers. 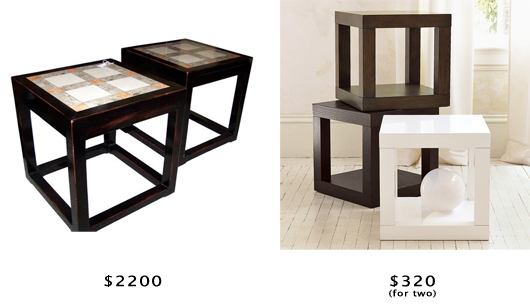 So it's easy to see that $350 for a pair of tables from CB2 is, oh, I don't know, a slightly better deal than $3500 for almost the exact same ones from 1stDibs. Let's calculate, shall we? Budget Check: $3500 - $350 = $3150 worth of white V-neck American Apparel tee shirts for every day (and club-filled night) of the year. Those things are expensive, right? Now Edward Wormley was an awesome designer and those tables are no doubt solid rosewood, but I'd be perfectly happy with these classic knockoffs tables at Home Decorators which are inspired by the originals, and are oh so sensibly priced. But if you're a true tightwad, you'll go for the stunningly cheap version from Ikea for only $12.99. It even comes in red. Budget Check: $4000 - $280 = $3720 worth of spinner rims for your fly Toyota Prius. 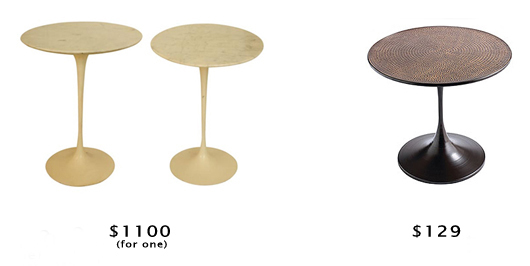 Warren Platner is one of my all-time favorite designers, but until someone starts paying me to write for this blog, I'll have to stick to the similarly awesome Tornado tables from CB2, which were pretty inexpensive to begin with, but now that they're on sale they are downright thriftacular! I almost feel like it's my duty to buy them, like I must for the good of bargain hunters everywhere, but I will admit that I'd spend a few extra dollars on oversized glass tops to give these babies some extra presence. Budget Check: $3400 - $160 = $3240 worth of Stunna Shades. I wear my sunglasses at night. 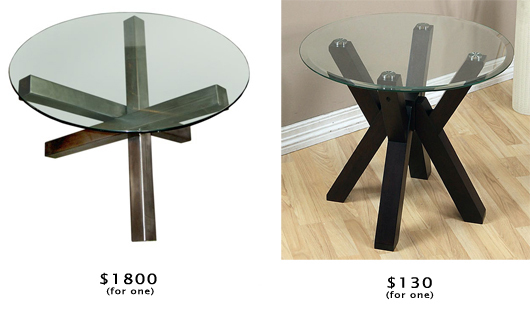 The Deal Hunter blogged about tubular steel tables some time ago, and while I'm not totally convinced on their awesomeness, Overstock really does a great job of magnetically attracting my credit card number with their low prices, spectacularly FREE shipping (there's always a coupon online to knock the nominal $2.95 charge off your total), and rockin' customer service. No, this is not an infomercial, I really do heart Overstock. Too much. Budget Check: $1800 - $130 = $1670 worth of high top neon Nike Dunks. If only Overstock sold those, too. The ubiquitous Saarinen tables, featured in just about every contemporary decor magazine. Actually they're feeling pretty overused, but hey, I've got one (not an original! ), so who am I to prevent you from getting one, too? Here's how to get your own: Pier One. Fo' realz. Spray paint that baby white and you're good to go. Of course there are so many different versions out there; CB2 sells one for even less, but I don't care for the legs on that one. Whatever -- you can cruise their site and decide for yourself. Budget Check: $1100 - $129 = $971 worth of Kanye West itunes. Disseminate Stronger to the entire world, yo! Ok, to get the original tables' look, this requires a little DIY action, but stay with me... you can do it! So the 1stDibs tables have marble tops and the lovely but plain West Elm versions do not. Why not grout and tile the tops of the less expensive versions? A mosaic would be interesting. Or you could wedge a cool piece of artwork -- like an abstract mod screenprint -- between a piece of glass and the tabletop. Can you dig it? Budget Check: $2200 - $320 = $1880 worth of subwoofers. Try not to blow the glass off your new tables! Yeah, this one might take some vision, but I'm sure you can see the very large "FOURTEEN THOUSAND" in the picture above. Who are these people kidding? Driftwood, pine cones, seashells and white paint? Check, check, check and check, thanks in large part to Twiggie.org. After you finish your handiwork, you can laugh all the way to the bank. Budget Check: $14,000 - $400 = enough to throw your friends a huge party, and maybe enough to book Prince as the headliner. Isn't fiscal responsibility fun?